NEW YORK—Lotte New York Palace on Madison Ave. has opened its signature restaurant Villard in the landmarked space that was commissioned over a century ago as a neo-Italian Renaissance residence known as The Villard Mansion. 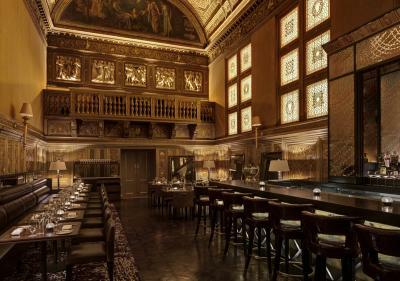 The restaurant encompasses two dining rooms, The Gold Room and Bar and Gallery Room, within the historic space. Villard is offering a “power breakfast” concept Monday through Friday from 6:30 to 11:30 A.M. and Saturday and Sunday 7 A.M. to noon, and will feature a New American menu comprised of “farm house” breakfast fare. The Villard Gold Room bar is open daily, serving hand-crafted cocktails, local beer and wine by the glass. Chef De Cuisine Oscar Granados is overseeing the culinary direction of the restaurant. “This is an exciting new chapter for Lotte New York Palace, and I look forward to bringing Villard to the forefront of the New York City breakfast and brunch scene. The breakfast room at Villard will be a unique and welcomed addition to the Midtown East neighborhood for hotel guests, local residents and business executives as well,” stated Director of Food and Beverage Martin Mariano.